In order to give appropriate semantics to qualitative conditionals of the form if A then normally B, ordinal conditional functions (OCFs) ranking the possible worlds according to their degree of plausibility can be used. An OCF accepting all conditionals of a knowledge base R can be characterized as the solution of a constraint satisfaction problem. 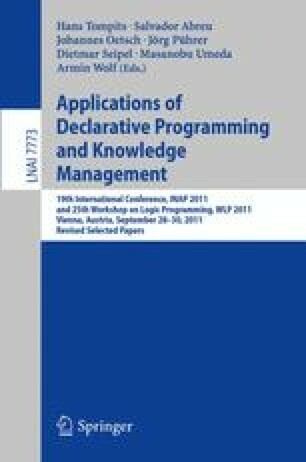 We present a high-level, declarative approach using constraint logic programming (CLP) techniques for solving this constraint satisfaction problem. In particular, the approach developed here supports the generation of all minimal solutions; this also holds for different notions of minimality which we discuss and implement in CLP. Minimal solutions are of special interest as they provide a basis for model-based inference from R.
The research reported here was partially supported by the Deutsche Forschungsgemeinschaft – DFG (grants BE 1700/7-2 and KE 1413/2-2).